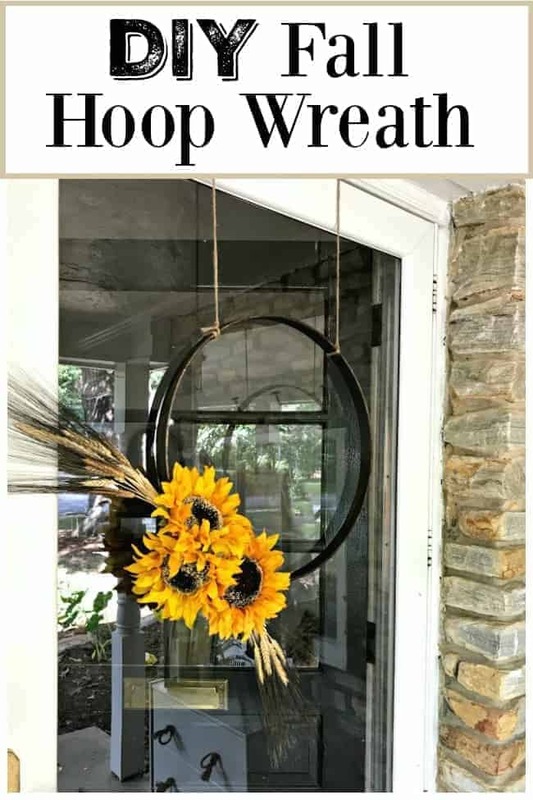 How to make a fall wreath for the front door with an embroidery hoop. If you’ve been hanging around here for a while, then you know that every season I whip up an easy DIY wreath for our front door. I don’t want to disappoint, so we’re continuing the tradition with a simple fall front door wreath with an embroidery hoop that I found floating around in the basement. I also made a video so make sure you check it out at the end of the post. I’ve had a love affair with my hanging basket for the past several seasons (you can see some of my creations here and here). This time I thought I’d ditch the basket and really change it up with something that is very simple in design. Not only is the design simple but it was also very easy to make, with just a few supplies. Perfect for me because I get distracted easily if I’m doing anything complicated. So let’s get right to the supply list and how-to. 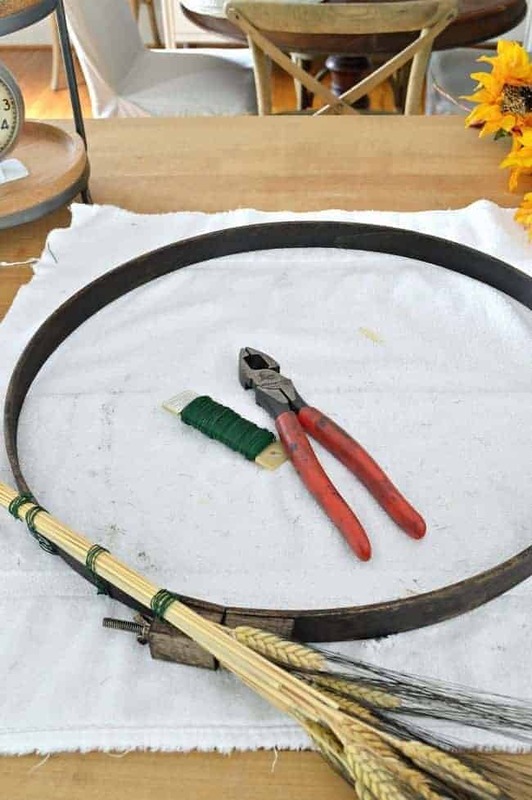 To start my wreath, I separated the 2 pieces of the embroidery hoop. I was going to use the inner hoop but the sticker left a residue and I couldn’t remove it. 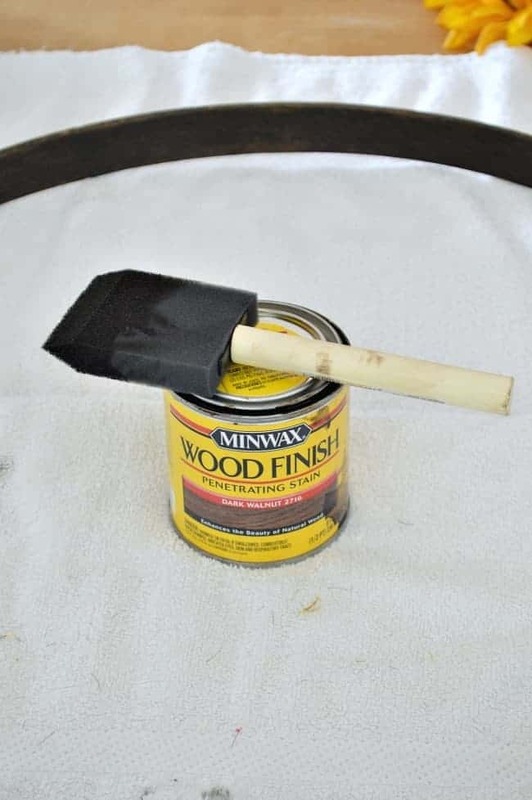 Next, I stained the hoop. I wanted to warm up the wood so I chose my favorite color, dark walnut. 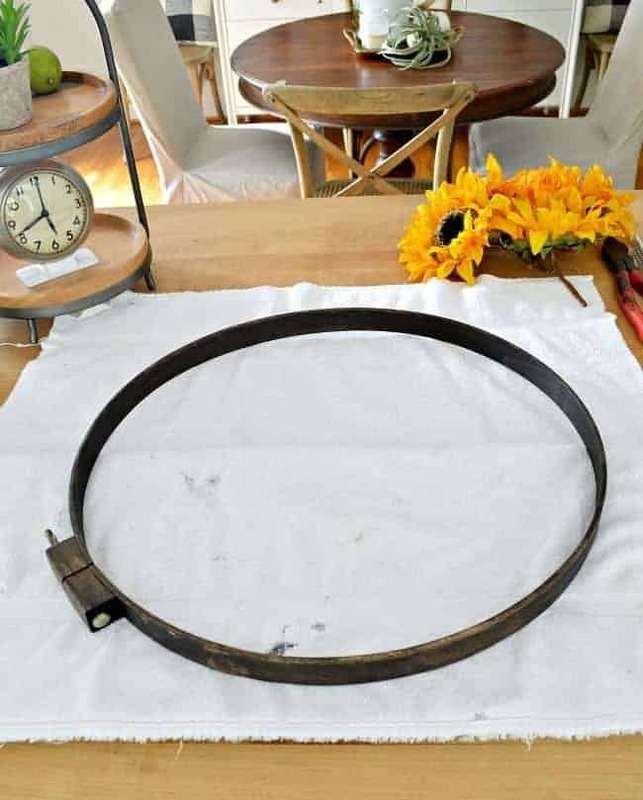 After the stain dried, I started assembling my wreath. 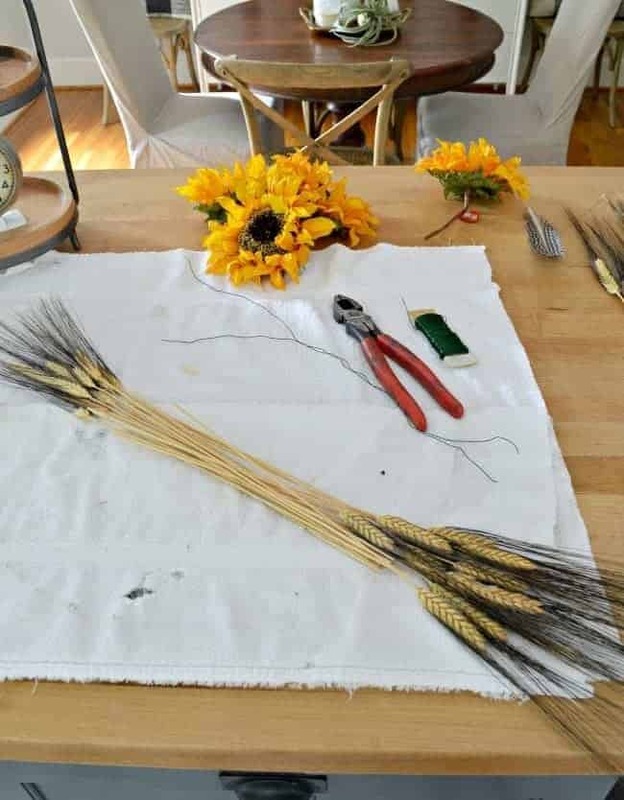 The wheat stems were pretty long so I used my floral clippers to cut some of the length. I didn’t count how much was in each bunch, I just eyeballed it. Remember, we’re keeping it simple. I split the wheat in half so both ends of the wheat had “flowers”. Next I took two pieces of the floral wire and tied the wheat together. 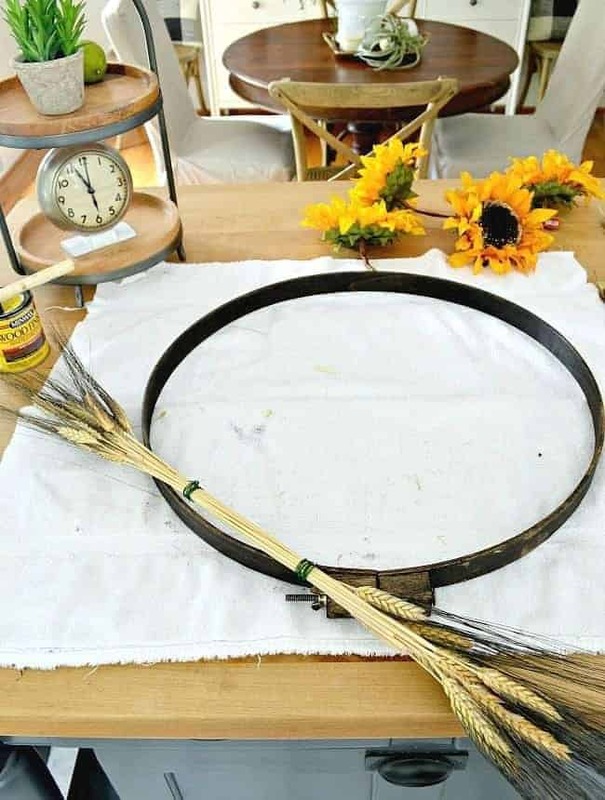 After I tied the wheat together, I took 2 more pieces of wire and attached it to the hoop. Now it was time to add the sunflowers. First, I cut each one down so that the stems were short. Then I wrapped a long piece of floral wire around the stem. After I wired all 3 flowers, I attached them on top of the wheat and around the hoop. I go into most projects with an idea of what I want to do, but I’m never really sure how it’s going to look until I’m done. This one came out a bit different but I liked the asymmetrical look so I decided to hang it that way. Not an easy thing to do. Well, once we figured it out it was easy to hang but it took us a few tries to get it right. Since I couldn’t use a traditional wreath hanger, I went with my old standby…jute twine. 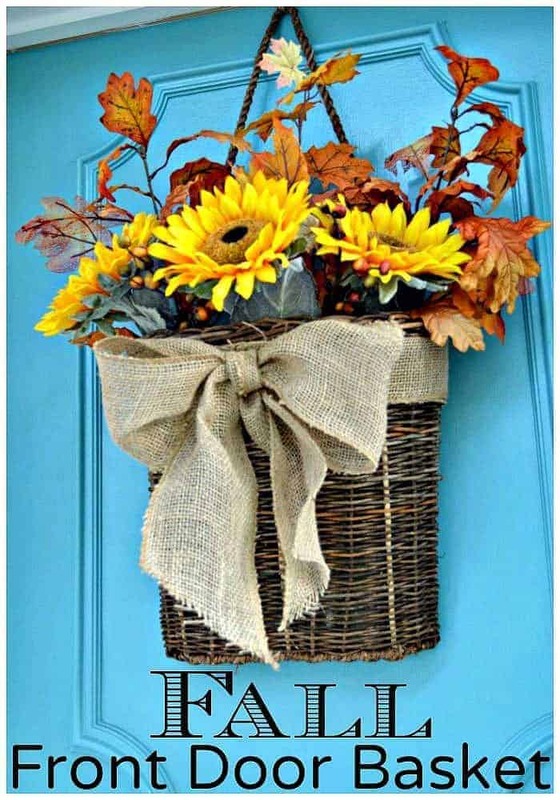 2 pieces to get this simple fall wreath to hang just so. 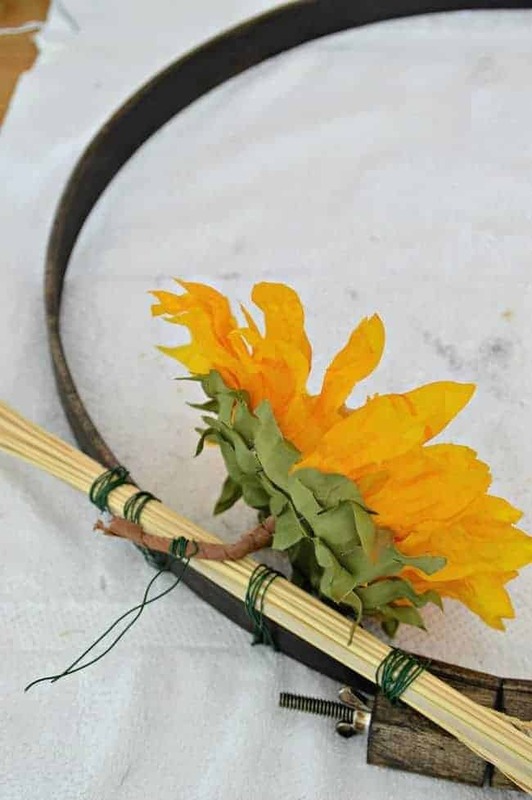 I didn’t use the feathers in my tutorial but just stuck them in by the sunflowers to see how they looked. I actually liked it better without. Not my usual front door decor, but it’s a nice change. I’ve decorated the front porch for fall and I can’t wait to share it with you. It has turned out to be my favorite space in the cottage to decorate for fall. How’s your fall decorating coming along? Want to see my quick how-to? Check out the video. I’ve also decorated the cottage simply this year. You can check out my whole house fall tour, here. I've shared my fall tour for this year if you would like to check it out, go here. 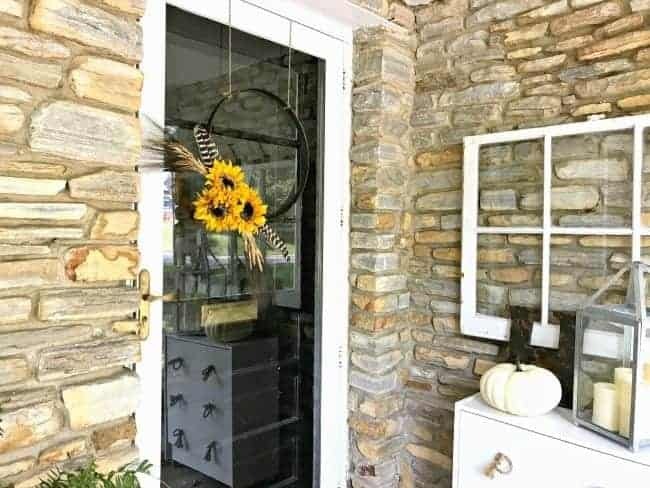 You can also check out this easy fall front door basket that I created when we lived in Illinois. So simple and elegant, Kristi! Shared on Tuesday Turn About #5 and pinned! 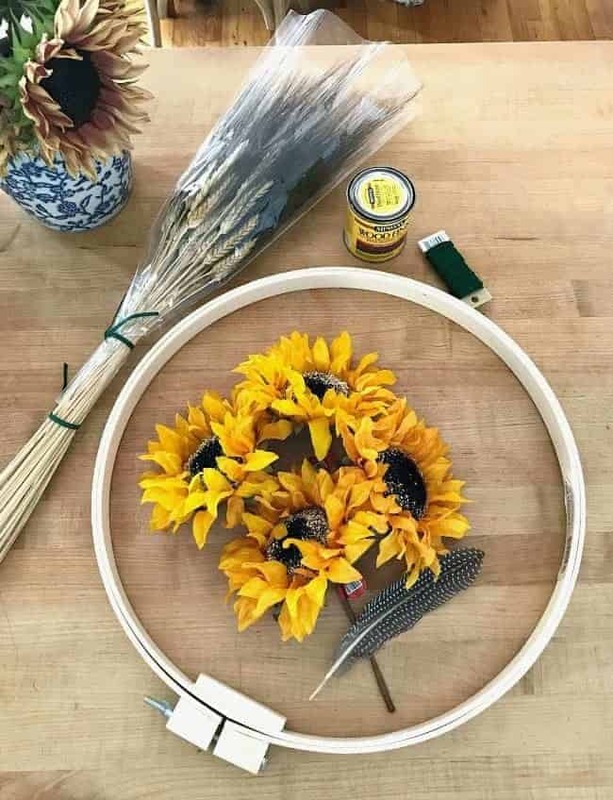 I never thought of using an embroidery hoop! 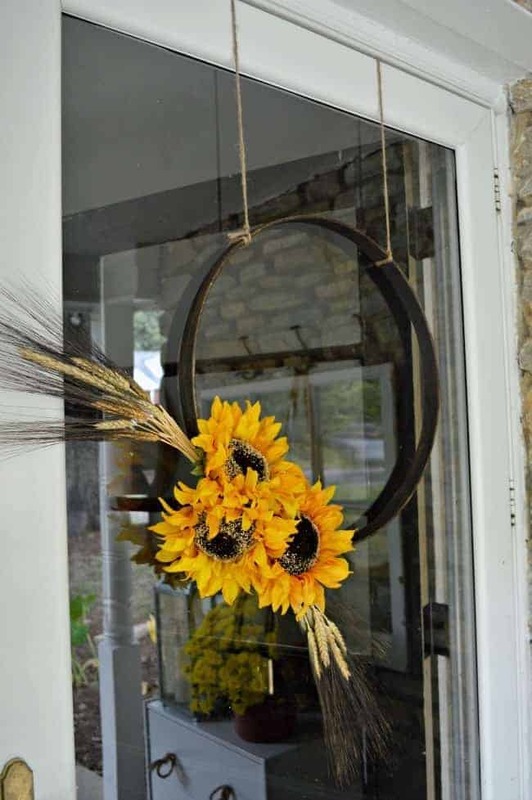 I love sunflowers and the simplicity of this! Thank you! Thanks so much Sandra! It was my first time working with an embroidery hoop and it was so easy. It’s just the perfect size and shape. Just amazing! Would you kindly tell me what is the best way to decorate your home for fall than with our festive Pumpkin Wreath? Thanks so much! 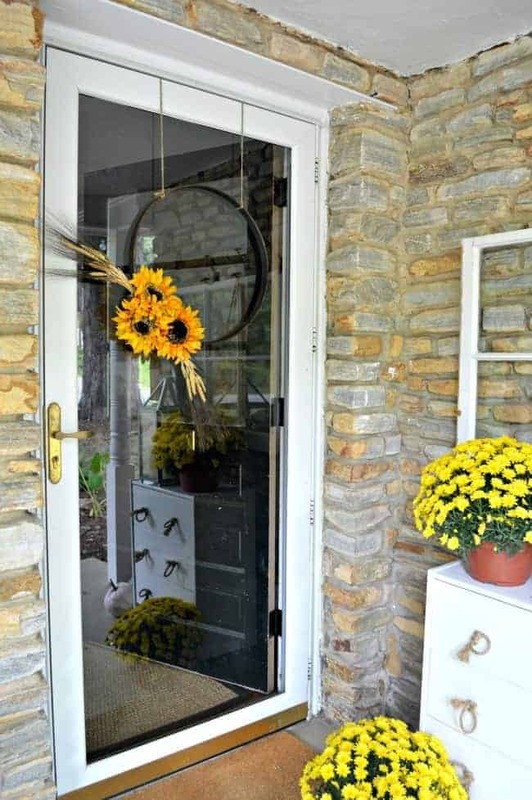 Are you looking for front door ideas or decorating your home for fall ideas? 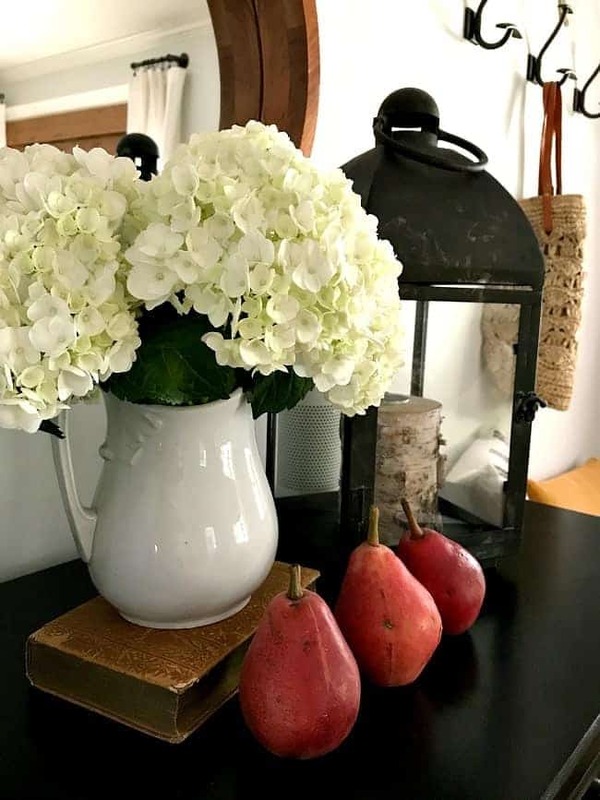 I’m hosting a fall home tour this week so you should find lots of inspiration from everyone sharing their homes. Thank you, thank you, thank you!!! I’m so excited, I can’t wait to receive them! I really like the simplicity of this wreath. Congratulations to Stephanie. Thanks so much Debbie. It’s definitely simple and not my usual style but I like the way it turned out. I love all your wreaths. My all time favorite is the fourth of July one. Love that one alot. Hi Kristi – Welcome back! This is a beautiful wreath, thank you for sharing the tutorial and Happy Fall! Simple and lovely, that’s the way i like it. This year i gave a lot of my stuff away,i’m into less is better. Thanks so much Marlene! I like simple too. 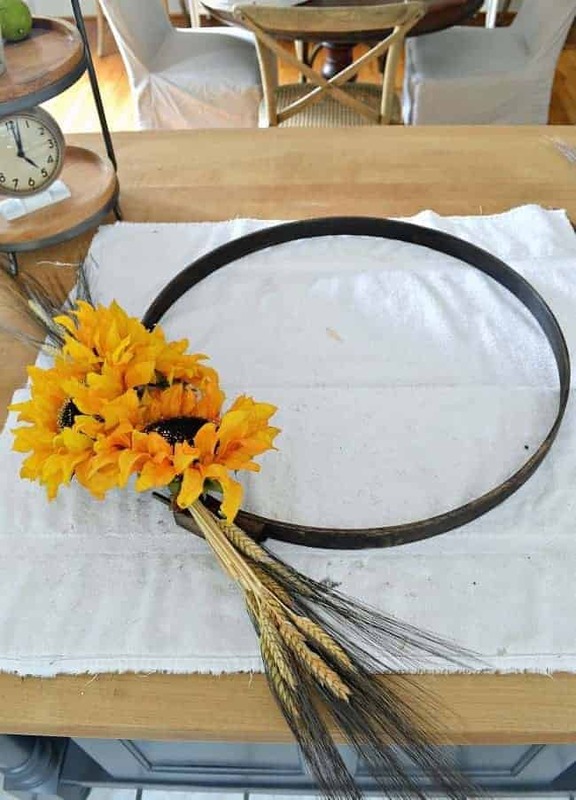 Your new wreath turned out great, Kristi. I think I want to try this.